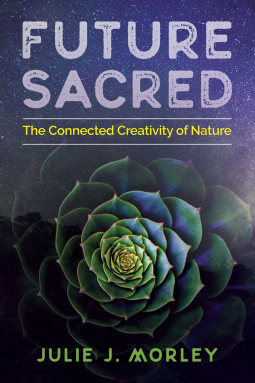 In Future Sacred, Julie J. Morley offers a new perspective on the human connection to the cosmos by unveiling the connected creativity and sacred intelligence of nature. She rejects the “survival of the fittest” narrative--the idea that survival requires strife--and offers symbiosis and cooperation as nature’s path forward. She shows how an increasingly complex world demands increasingly complex consciousness. Our survival depends upon embracing “complexity consciousness,” understanding ourselves as part of nature, as well as relating to nature as sacred. Morley begins by documenting how indigenous cultures lived in relative harmony with nature because they perceived themselves as part of the “ordered whole” of all life--until modernity introduced dualistic thinking, thus separating mind from matter, and humans from nature. The author deconstructs the fallacy behind social and neo-Darwinism and the materialist theories of “dead matter” versus those that offer a connection with the sentient mind of nature. She presents evidence from complexity studies, cultural history, philosophy, indigenous spirituality, biomimicry, and ecology, highlighting the idea that nature’s intelligence and creativity abound everywhere--from cells to cetaceans, from hydrogen to humans, from sunflowers to solar panels--and that all sentient beings contribute to the evolution of life as a whole, working together in sacred symbiosis. Morley concludes that our sacred future depends on compassionately understanding and integrating multiple intelligences, seeing relationships and interdependence as fundamental and sacred, as well as honoring the experiences of all sentient beings. Instead of “mastery over nature,” we must shift toward synergy with nature--and with each other as diverse expressions of nature’s creativity. Future Sacred beautifully makes the case for humans to see themselves as a part of nature. The chapter on common shapes and patterns in nature was particularly interesting. However, this book is very academic and seemed targeted to a graduate student level. The author spent a lot of pages discussing the history of philosophy. If you're interested in philosophical arguments for environmentalism, this is the book for you. However, it is not for the average reader.